Two weeks ago we were in the process of switching our room with the guest room. The guest room is almost twice the size of our room and we didn't want to make it the nursery. We didn't think a tiny baby needed a big room and we were getting a little claustrophobic in ours. So we started with the closets. Oh brother! The guest room closets were packed to the brim with crapola. The only the reason my house could look clean, was because those closets were full! So we emptied them and then filled them with our clothes. We got rid of a ton of stuff! Then we filled our old closets with storage stuff. SO, we decided to save that for another time and just make things easy for now. So we switched back our closets and we are still in the small room for now. I did feel the need for change though. So I did a mini makeover for super cheap! And this is our old room that looks new! I got this green bedding at Target for $35! It came with the shams. I already had the white chenille coverlet. I painted the red dresser white along with the M & the D. I got the bird plates at Pier 1. The Dumpheys on Modern Family have that plate too, so it's like I'm famous! The cushions are on the floor waiting for me to paint the rocker. I just changed a little bit over here. I already had the green tin frame and the green frame with our wedding picture in it. The wreath was over our bed before. I got these cute sconces from Melissa at Golightly's, and I already had the shutters that I was using in the guest room. I like to steal from other rooms! And the green wreath is from Golightly's too out of Lisa's space. Now I feel like making over the rest of my house! So sorry to hear about your miscarriage. I love all the green! My favorite color! Great job! Wow this is beautiful! I love all the neat touches you have in both rooms. Wanna come do my house? It's so BARE. You're room looks wonderful .... so fresh and ready for spring and summer. I changed up my bedroom linens to light and white this weekend too. Doesn't it feel great? very lovely, I want to put lights on a shutter like that in my bedroom, but have never gotten it done, great job! I wish I knew you in real life - you are such a fun person with the MOST fun style!! I always LOVE what you are doing in your house! I'm getting caught up on blogs and JUST read back and saw about the baby. I'm so very sorry. Praying for you right now. SO happy that you got pregnant! I know you have been on a roller coaster of emotions but I pray God blesses you again - you were born to be a mom! Katie is precious! 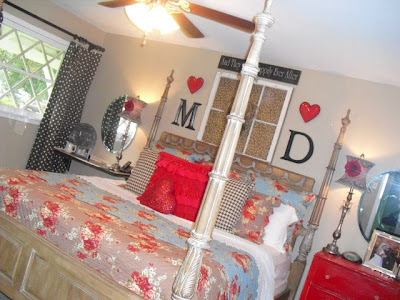 I love what you did with your bedroom, it looks FAB!! Katie looks darling in her cute little dress, swinging...hugs to her! I so love your decorating style!! You are motivating me to finally make some changes around here. I can't wait to see more!! I love the make over! 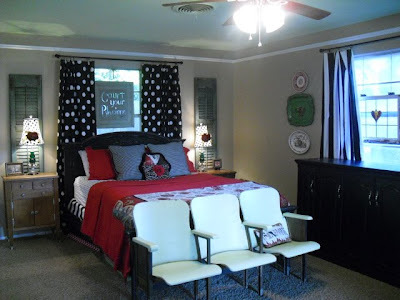 I"m a big fan of the "before" room as well, but either way, you've inspired me to do something with our bedroom! It's HUGE, and I have almost no decorations at all! thanks! 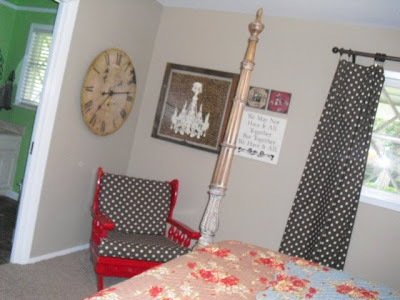 I would LOVE to see more of your makeover tips (where to shop, kinds of paint, etc) I really love reading your blog and you have such great taste!! I'm just in love with your style!!! I wish I could put stuff together like you. Anytime you are bored and want to makeover something I will gladly send pics of my house! Ha! Great minds think alike! I bought the same bedding at Target. What a steal. I almost bought every color. You are so talented. It looks amazing.